Did you know that geese are good guard animals? Learn why in this an excerpt from The Modern Homesteader’s Guide to Keeping Geese by Kirstein Lie-Nielsen. Geese have been used as guardian animals for centuries. Why? Because they are uniquely suited to the task. Not only are their pierc­ing honks excellent alarms, but they are instinctively protective and more naturally suited to guard work than humans, or even dogs. Because birds can see ultraviolet light, their vision is far superior to that of people. Their distance vision is remarkably good (the better to spot possible predators), and they can sense movement long before an ordinary person can. While most birds don’t react to what they see in a way that is helpful to people, geese do. Geese sound off loudly and aggressively, ideal attributes for guarding. Geese are also territorial: they know where their home is, and they defend it, especially during mating and hatching season. Few domesticated birds share the same territorial tendencies, and fewer still have the pugnacious attitude for attacking intruders. About midnight a large band of them [the Gauls] scaled the cliff and made their way upward in silence …. Neither man nor dog were aware of their approach. But there were some sacred geese near the temple of Juno …. The crea­ture is naturally sharp of hearing and afraid of every noise, and these, being specially wakeful and restless by reason of their hunger, perceived the approach of the Gauls, dashed at them with loud cries, and so waked all the garrison …. The defenders, snatching up in haste whatever weapon came to hand …. So the Romans escaped out of their peril. Geese were used to protect a Dumbarton, Scotland, warehouse where the famous Ballantine’s whiskies were aged. These geese served from 1959 until 2012, when modern CCTV cameras were added. Known as the “Scotch Watch,” the fierce white geese were the subject of numerous TV documentaries and magazine articles. Even if you aren’t using your geese to guard, their skill as alarm bells is amazing. Anything out of place in the barnyard or approaching unexpectedly will be greeted with rowdy honks. If you are familiar with your flock and spend enough time in their presence, you will be able to distinguish their alarm honks from mating calls and general chattiness. This talent can be invaluable, giving you extra minutes to get to your chickens before a fox attacks or just letting you know that the mail has arrived. They are vigilant about possible aerial predators such as hawks, and will notice a potential threat long before you or your chickens do. Geese employed as alarms need to be kept in a place with a good van­ tage point over the rest of the farm, and should be enclosed within their space. Because of their wandering nature, it’s not uncommon for unfenced geese to get distracted from the job of watching out for strangers. Nighttime, however, and the goose’s advantage as a guard animal di­ minishes: they are virtually blind at night. They will still sound a warning if they notice any movement, but they won’t react until much later than they usually would in daylight. Also, at night, they are somewhat clumsy in identifying what the threat actually is. Note, as well, that geese will try to expand their territory if not fenced in, and may end up attempting to guard the neighbor’s lawn from the neighbor. If you live in a more suburban area, keep your geese fenced away from areas they should not approach and always make sure they are safely enclosed at night. Using geese for guarding does have its risks. The first one is the safety of your geese, fearless attackers who sometimes take on more than they can handle. While a goose will effectively scare off any predator smaller than a cat, and can even chase away a timid dog or human, against a coyote or larger predator, they will lose the battle. The best way to avoid problems is to be smart about how you are using your guard geese. 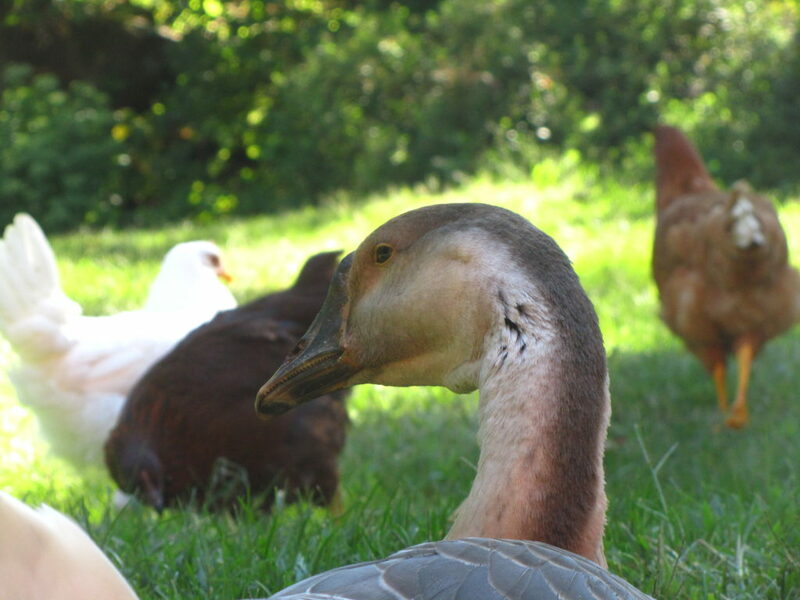 Geese make great protectors of smaller flocks, such as chickens, ducks, and quail. They can also protect a building or your personal possessions. While they are excellent at sounding the alarm, be aware that they might succeed in chasing off only a few intruders. Thieves and intruders are more sophisticated than they were in Rome in 390 BC. To protect smaller poultry, it is important to use only a single guard goose or possibly a pair, but no more than that. One goose per flock of chickens or other poultry helps to convince the goose it is related to the chickens, and therefore needs to defend and protect them. To further help the goose bond with its congregation, raise your guard goose from a gosling with the chicks. Similar to how geese imprint on humans if raised with lots of handling, goslings nurtured with chicks and not other geese will imprint on them and have a stronger sense of flock with them, promoting better defense of the hens. They will also get along better with your chickens this way, whereas geese raised separately may try to peck at or chase smaller birds. A goose used for the guarding and alarm work of a chicken flock may not be as interested in, or bonded to, people as they are to their farmyard companions. They will still recognize their owners, and will limit defen­sive attacks and aggressive behavior only to what they perceive as threats to their friends. Guard geese will share some of the chickens’ scratch and water access, but they are happy to graze the pastures, making them a very affordable option to help in maintaining the safety of your hens. Most geese used as alarms are not specifically kept for that purpose. Any goose on the farm can be a protective single guard, thanks to their keen eyesight, clamorous voices, and intimidating behavior. However, if you want geese specifically because of their ability to guard, it is a good idea not to imprint with them as closely as you might with pet. If you are not guarding other poultry, but want to keep your property safeguarded, try keeping a larger Bock for intimidation purposes. While a single goose is no match for a large dog or coyote, a full Bock of them may be enough to scare off such predators. And geese can certainly be effective at intimidating people, especially when individuals harbor pre-existing ideas or phobias regarding geese. 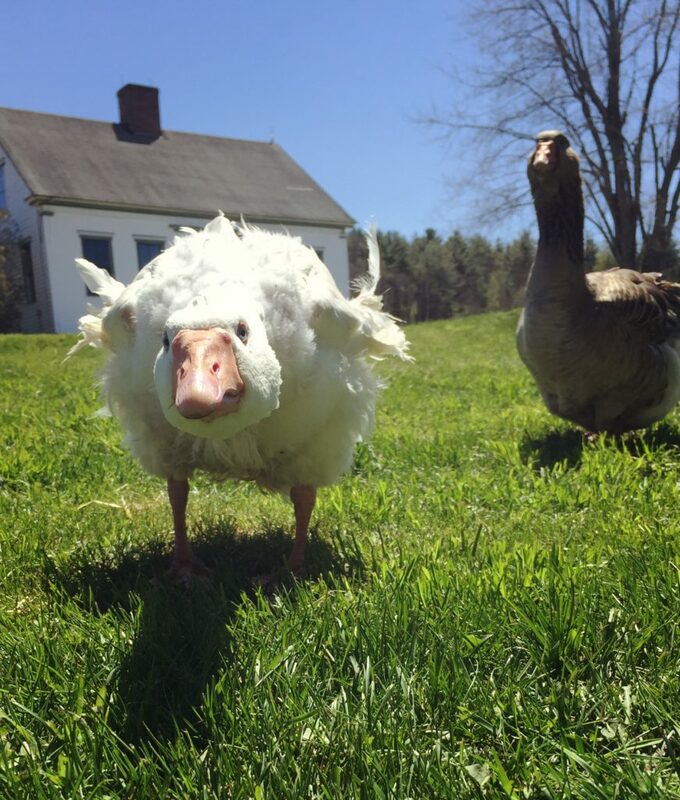 The geese on our farm aren’t employed as guards, but they are still successful at that task. As our Bock has grown, we’ve noticed a decrease in attacks on our chickens, and we never have a neighbor stop by without hearing the geese announce the call long before the visitor has reached the door. Because our geese have imprinted on humans and are accustomed to being physically handled, they don’t attack strangers; they simply alert us to their presence. Occasionally, they will run towards a person, but they always stop short of making a full charge. The great thing about guardian and alarm geese is they don’t need any training to do their job. Protecting is a natural instinct for them; they will take to it like ducks to water. This can be a handy advantage to backyard geese, and many farmers see this as a primary reason to invest in these feathered sentries. A goose for every Bock of chickens can ensure that everyone, geese and hens alike, is safe and happy. This piece, “The Farmer’s Alarm System,” is an excerpt from The Modern Homesteader’s Guide to Keeping Geese by Kirstein Lie-Nielsen. It’s used here with permission of the publisher, New Society Publishers.